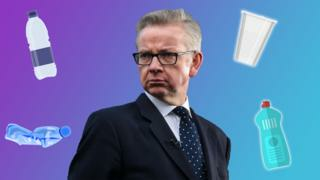 Michael Gove, the government minister in charge of the environment, has told Newsround that we must listen to the kids who are passionate about the planet, including those who chose to take a day off school for climate change. He thinks kids shouldn't skip school but said: "It's saying to my generation, you're the ones who created this mess and you better clean it up." It comes after students in 30 towns and cities across the UK skipped school earlier this month to protest against the damage humans are doing to the environment. Speaking in London, Gove said: "You should listen and respect the fact people feel so strongly." Kids campaigning to protect the planet "should be listened to"
Why is climate change a problem? Climate change: What is it? Why was Michael Gove speaking to kids? Michael Gove was speaking to a group of young climate campaigners about improving recycling in the UK. Specifically, they were talking about something called a "bottle deposit scheme". This is where you you have to pay a bit extra to buy things in plastic bottles. Then, once you've finished with the bottle, you put it into a special vending machine. The machine then gives you a voucher for money back. The scheme has been really successful in other countries like Norway, where 97% of bottles are recycled. In the UK, only half of plastic bottles are currently recycled. Mr Gove told Newsround that he wants the UK to be as successful with recycling as places like Norway. What is the problem with plastic? Just a third of plastic waste can be recycled. So what's going on? Why do people want to ban plastic? I think the U.K. should definitely have this!